There’s magic in the memories as great Disney moments are captured right here for you and your family to enjoy. Oscar(R)-winning actor David Niven (Best Actor, SEPARATE TABLES, 1958) stars as a millionaire with two bored grandchildren who fake their own kidnapping, holding themselves for ransom! 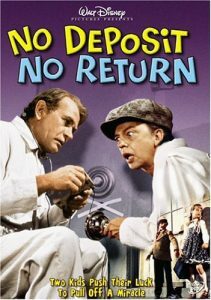 In cahoots with the kids is a pair of down-on-their-luck safecrackers (Darren McGavin and Don Knotts). It doesn’t take long for the two young pranksters to discover just how impractical a practical joke can be. The mayhem escalates into an all-out cops-and-robbers chase filled with every bit as much hilarity as excitement. Duke, Jay: [in a cab] Take off, driver. Duke (Darren McGavin): This cab is taken! Tracy: Yes it is, we’re taking it. Duke (Darren McGavin): [to Carolyn] What kind of a mother are you? Spread out all over the world! You can’t raise your kids long distance, or by teachers, a maid, or a grouchy grandpa! Bert (Don Knotts): Or a Bert! Your kids are a real handful you know! Carolyn (Barbara Feldon): What would you know about raising my children? Duke (Darren McGavin): We’ve just spent three whole days with your kids, when was the last time you could say the same thing? Duke (Darren McGavin): [to Carolyn] Your children are looking for attention and affection and they’re going to get it from anybody they can, even two ‘kind of’ kidnappers. Tracy: After Honolulu, we go to Australia, and then 14 hours later we’re in Hong Kong with Mother. Jay: It’s a great plan, Tracy! If she can’t come to us for our vacation then we’ll go to her! Tracy: Yes, but there’s only one little problem. How’re we going to get the $1200 for two tickets? Bert (Don Knotts): [hears sirens] THEY’RE HERE, IT’S THE COPS! Duke (Darren McGavin): It’s fire engines, and they’re passing by. Don Knotts said that one day, while he was filming scenes for this project in the San Francisco airport, a director approached him and said he would like to cast him in a dramatic film one day. Although it never happened, Knotts said he was flattered by the offer. The director was Sam Peckinpah.